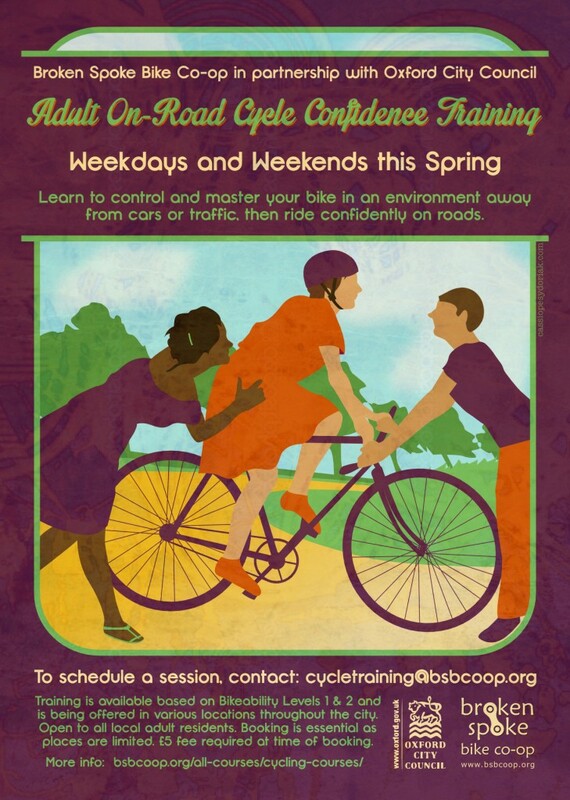 Broken Spoke Bike Co-op | Learn to Ride in 2014! Learn to Ride in 2014! Want to learn to ride a bike or gain more confidence on the road? It’s never too late to get started, which is why Oxford City Council is partnering with the Broken Spoke Bike Co-op to provide very low cost cycle training for adults in Oxford. Broken Spoke’s expert on-road cycle training, based on the national Bikeability model, is available to any adult in Oxford at a very reduced price of £5 for one session thanks to subsidy from Oxford City Council. Both nervous cyclists and total beginners can quickly gain confidence and new skills in a friendly one or two-hour session. A free cycle training programme offered by Oxford City Council earlier in 2013 helped to identify a clear demand in Oxford not only for on-road adult cycle training but also for people to learn how to ride a bike from scratch. Councillor Colin Cook, Board Member for City Development, says: “The subsidised on-road cycle training is part of the wider Oxford Cycle City initiative being led by the City Council which aims to increase cycling and improve the cycling experience in Oxford. “There are lots of cyclists in Oxford but it can be a bit daunting to cycle on the roads, so this training will help boost people’s confidence. Depending on your previous experience you will initially learn to control and master your bike in an environment away from traffic and then get out on the roads in real traffic situations in Oxford. On-road cycle training gives you a real cycling experience so that you are able to deal with traffic on short journeys such as cycling to work. Training is delivered on a one-to-one basis at locations which are convenient for the trainee and is available in one or two-hour sessions on Wednesdays, Fridays and Saturdays throughout early 2014. Sessions will take place on your own bike with your own safety equipment. Wearing a helmet or hi-viz clothing is a personal choice rather than a requirement. A roadworthy bike or lights in low-light conditions are required however. Trainees learning how to cycle for the first time (level 1A) can be provided with a bike by the Broken Spoke if necessary. Routine bike checks will be included as part of the training and an initial assessment of cycling experience will be used to adapt the course to the trainee’s needs.